Department Chair: Steven P. Lundblad, Ph.D.
Geology is the study of the earth: its form and composition, the changes it has undergone and the dynamic forces shaping it today. 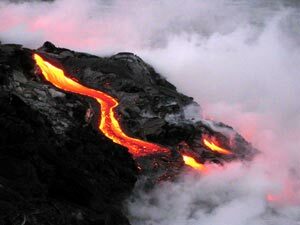 Geologists are interested in what makes volcanoes erupt, what forces produce mountain ranges, where earthquakes occur and how they can be predicted, how glaciers carve out the landscape, and where petroleum and minerals can be located. The mission of the UH Hilo Geology Department is to provide students with a rigorous, high-quality foundation in geological science. The primary goal is to prepare students for graduate studies, work as professional geologists, or careers in secondary education, planning, or natural resource management. The Geology Department also supports the liberal arts mission of the University by providing general education students with a broader knowledge of their natural environment. Although delivery of quality undergraduate education is the focus of the Department’s efforts, the Department also supports and contributes to advancement of scientific knowledge, application of geologic knowledge, and community education and service. The Geology program exposes students to the theory and application of a wide range of disciplines within the geosciences. The curriculum focuses on the composition, structure, history and dynamics of the Earth. Students will acquire a strong background in the basic sciences as they address geological problems using the tools of chemistry, physics, and mathematics. Hilo’s unique natural setting on the slope of an active volcano makes it an ideal place to experience firsthand the more dynamic aspects of geology. Both laboratory and field activities are important components of the program, and students can expect to develop their descriptive, analytical and interpretive skills. Students are advised that field trips are sometimes conducted outside of class hours. The study of geology prepares students for careers in environmental science, natural resources, and scientific research on diverse topics including volcanism and hydrology. Many of the students graduating from the B.S. program go on to pursue graduate degrees. Develop skills in observing and recording geologic features and processes. Develop competency in the interpretation of earth science data, including both qualitative and quantitative analyses. Express earth science concepts in writing. Using computers at a level consistent with current professional practice. The Department’s laboratories, classrooms, and support facilities have been designed to house a complete and state-of-the-art geology program. Laboratory facilities include those for rock preparation, mineralogy and petrology, wet chemistry, seismic monitoring, and a geographic information system (GIS) computer laboratory. Students also have access to instruments and computers used for volcano monitoring through the Center for the Study of Active Volcanoes (CSAV), which is a training and outreach program associated with the Geology Department. CSAV’s mission is to provide training and information on volcanic and natural hazards that occur in Hawaiʻi and worldwide. Instruments available to the Geology program through CSAV include Global Positioning System (GPS) receivers, total field station and EDM instruments, precise leveling instruments, portable seismometers, and gas geochemical instruments. Last updated on Thursday, June 14, 2018, 9:38am HST.